As generally expected, the Almaty talks between the P5+1 and Iran earlier this month failed to achieve a breakthrough, or even an agreement to hold another round of talks in the immediate future. Interestingly enough, this dismal outcome has not aroused much interest; the media reports and commentary on the latest round of talks have lacked any sense of crisis. Iran is satisfied with the result because it serves its interest of playing for time to advance its program, while warding off the prospect of a military attack. The United States, for its part, has resisted declaring the negotiations a failure, as such a conclusion would force it to pursue more coercive measures, which it is reluctant to do. In parallel to the failing diplomatic track, Iran is continuing to advance the development of its nuclear program. Slowly but surely Iran is advancing its nuclear program by enriching uranium to low and medium levels and developing a plutonium route to nuclear weapons. Consequently, we are approaching a point where Iran’s infrastructure is so advanced that the international community will no longer have any realistic option to veto an Iranian decision to build nuclear weapons. IAEA Director General Yukiya Amano recently stated that based on available intelligence the IAEA could not rule out the possibility that Iran has had a military nuclear program as recently as 2009, and perhaps up to the present. One of the more misinterpreted features of Iran’s behavior in the nuclear realm is the careful and cautious manner by which it proceeds. Iran engages in negotiations even though it has no intention of reaching a deal because this enables it to buy time, and makes it more difficult for the international community to justify a military attack. Iran is careful not to cross red lines that would provoke more aggressive action against it, beyond the economic sanctions that it has not been able to avoid. But this cautious, calculating Iranian approach is often mistaken as an indication of a more accommodating approach toward the international community. The most recent example of this is the claim that Iran is purposely keeping its stockpile of uranium enriched to 20 percent below the amount that would be needed for one nuclear explosive core (i.e. 250 kg, if enriched to higher levels). By February 2013, Iran had already enriched more than 250 kg of uranium-235 to 20 percent, but had reduced the readily available quantity of 20 percent enriched uranium to some 170 kilograms. Some believe Iran is adhering to a red line set by Israel Prime Minister Benjamin Netanyahu last September, but others view this as indication that Iran is demonstrating a more forthcoming approach. While much has been made of this issue, practically speaking Iran’s gesture is a mild one at best. Most of the 20 percent enriched uranium that has been removed to Esfahan, has been converted from uranium hexafluoride into an oxide – U3O8. As such, and contrary to the message that has been conveyed in the media, the conversion carried out does not neutralize the enriched uranium (unless it is irradiated), meaning that Iran can reconvert it into its original form in a short time, if all preparations are made in advance. The conversion also has little meaning because Iran can replace this 20 percent enriched uranium relatively quickly if it so decides. It is daily increasing its stockpile of 3.5% low-enriched-uranium, which is then available to be enriched to 20 percent and military-grade levels (93 percent). The speed at which Iran can achieve the higher levels of enrichment depends on the resources it would be willing to devote to this effort. As an example, generally speaking if 7 cascades operating for a full year are needed to produce 250 kilograms of 20 percent enriched uranium from the available 3.5 percent stock, the employment of 14 cascades would complete the task in half the time— assuming, among other things, the cascades contained the same amount and quality of centrifuges. With the reported 53 enriching cascades, this would pose no problem for Iran if all were used to enrich 20 percent uranium from 3.5 percent stocks (currently 5 are used for this purpose, according to the IAEA). The further enrichment from 20 percent to military grade needs very few cascades, and less centrifuges in each cascade, although they would need a different technical setup, which could be detected by the IAEA inspectors, if they had access to this activity. The upshot of this data is that although Iran’s reduction of its 20 percent stockpile does complicate its breakout potential, this can be overcome by the Iranians rather quickly. Some Iranian officials have also been stepping up their verbal provocations, through threatening to withdraw from the NPT and enriching beyond 20% levels. 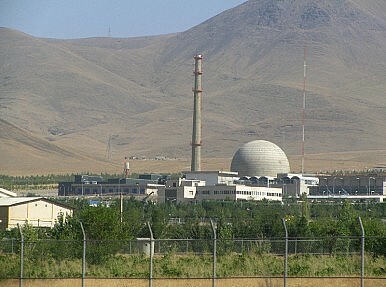 In addition, with Iran almost done constructing its heavy water, natural uranium reactor at Arak, potential major crisis lurks as military action against an operating nuclear reactor would probably be out of the question, and this would make the potential plutonium route, at least for this facility, immune from aggressive action. According to the information Iran has given to the IAEA, Arak could be operational as early as the first quarter of 2014. At this late stage, provocative steps run a real risk of military action on the part of the U.S. But Iran has a better option: continuing on its cautious route, which gets it ever closer to its goal, without taking actions that would elicit calls for a much harsher approach. The emerging reality is that Iran has no need to take any overly provocative actions because by gradually and methodologically building up its capabilities as it has been doing, it will eventually create a fait accompli that will enable it to move to any military option it desires, with the international community helpless to stop it. This is the challenge that the international community faces, and it must devise its policy accordingly while it still has time.